The cool weather is here and I'm in full on soup-mode. This morning I google searched "soup recipes" and 101 soup recipes by Canadian Living was the first link, categorized nicely by vegetable soups, meat soups, etc. so I skimmed a few and found this one. I've really taken a liking to kale, mind you I've only had it in it's limp, warm, soupy form but I really like it. This soup was pretty good, but not the best thing I've ever made. I found it a little bit on the bland side but the broth was only composed of water. I think I'd try it again but use chicken broth for a bit more flavour. I also may have gone overboard on kale, but live and learn! We concluded dinner with Macintosh apples and caramel dip, yum! The semester is quickly wrapping up and I'm getting anxious applying for real life jobs, but I'm anticipating the holiday season where everything is cheerful, warm, bright and the food is delicious. So many new things to try out this season and so many DIYs I'm itching to try as part of Christmas presents. I'm lacking in photos on my dslr but I just couldn't get the lighting right without shadows and bright spots and I was so hungry that I just took one with my iphone. I promise that a) I'm going to start cooking in the daylight and b) no more iphone photos. 1. In a large pot, heat 1 tbsp of oil. Add chopped onion and garlic and cook until soft, about 5 minutes. Add paprika, potato and bay leaf and cook for 1 minute. 2. Add 4 cups of water, salt & pepper and bring to a boil. Reduce the heat and simmer until the potatoes are tender. Add kale and beans and simmer until kale is tender, about 8-10 minutes then find and discard the bay leaf! 3. While your kale is simmering, cook the sausage in a skillet until cooked through. 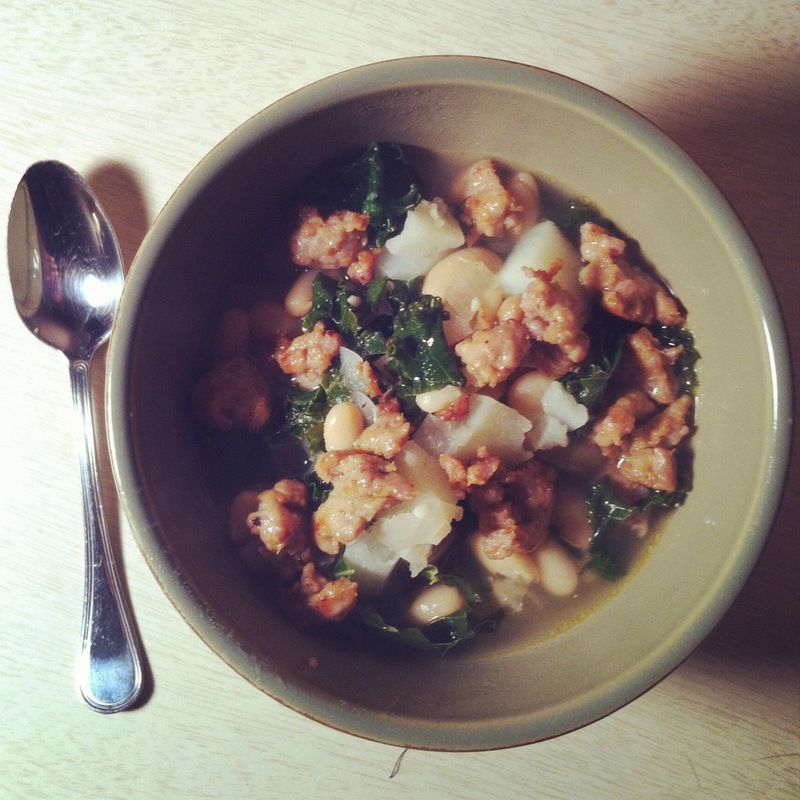 Once the kale is tender, serve the soup and sprinkle the sausage on top. We bought garlic buns to eat with our soup but didn't remember until we were done...but I'd recommend something on the side! More salt and pepper may add a bit more dimension to the flavour, but even vegetable broth may make a difference opposed to just water. Try it out and let me know! Until next time friends, happy making!